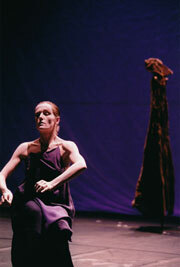 The myth of the Kikché Mayas is the groundwork for this solo. The gods created man, who he changed in their absence. They had given him everything: nurishment to live, for the senses, for the mind. Still men couldn’t nurishment this food responsibly. 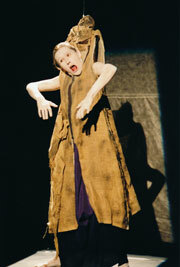 In this solo Sabine Seume plays with various roles and characters such as a distorted man as well as an observing and dealing godly character. Radically changing roles – unexpected and sudden – represent drastic transformations. The gods decide to reform the body and mind in three attempts. They create animals first, which while they are able to cluck and scream, they are unfortunately unable to talk to the gods. The gods then try to create a human body with wood, but the faces are immobile and rigid. Finally, they try a mixture of corn and water – which results in a something made of flesh and blood. In a Plexiglas tub, containing a sort of ancient soup, miraculous transformations take place and are portrayed by Sabine Seume as she experiences different developmental stages in the process of becoming human. A game of extremes: poetic, powerful, facet rich and strange.